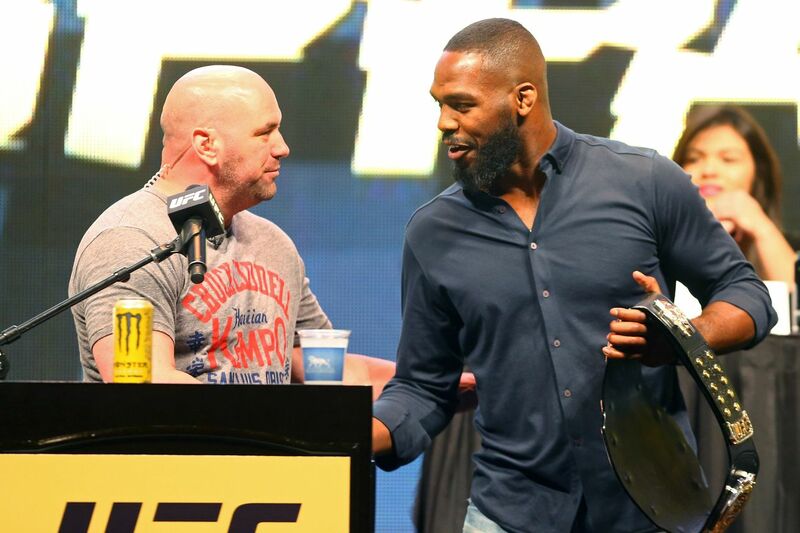 It was not a smooth path to UFC 197, which takes place tonight (Sat., April 23, 2016) inside MGM Grand Garden Arena in Las Vegas, Nevada, but it never really is drama-free when Jon Jones graces the top of the pay-per-view (PPV) marquee. The former Light Heavyweight champion returns from an 18-month layoff this weekend to battle Ovince Saint Preux for the interim 205-pound title. It’s not the fight fans — nor Jones — wanted, though, as division champion Daniel Cormier was forced to withdraw from the main event (read full details here) opposite Jones because of an injury sustained while training for the highly anticipated rematch. Prior to that mess Jones once again found himself mired in another, jailed several days for a probation violation that could have derailed his participation in the event altogether. The good news? Jones was permitted to fly to “Sin City” under certain legal conditions and, perhaps more promising, hired a full-time driver to ensure his vehicular ineptitude did not land him in hot water once again. Did we mention that he’s now drug-free, beyond motivated and looking like an absolute beast? Indeed, it’s been a wild ride. On the opposite side of the spectrum is Flyweight champion Demetrious Johnson, who will defend his title once again against Olympic gold medal-winning wrestler (2008) Henry Cejudo. Johnson sits right behind Jones on the top pound-for-pound fighter list (No. 2), due in large part to his absolute dominance in the 125-pound division. “Mighty Mouse” has defended his title seven consecutive times since winning the inaugural belt in 2012. And he’s motivated to break the all-time title defense record (Anderson Silva, 10) and cement his status as one of the most decorated UFC champions in history. That’s not all, though. UFC 197 features an explosive Lightweight showdown between Top 10-ranked dynamic strikers Anthony Pettis and Edson Barboza, as well as surging The Ultimate Fighter (TUF): “Smashes” winner, Robert Whittaker, looking to continue his climb up the Middleweight ranks at the expense of dangerous veteran, Rafael Natal. For the latest, LIVE updates and UFC 197: “Jones vs. Saint Preux” results TONIGHT click here. Ultimate Fighting Championship (UFC) welcomes Jon Jones (21-1) back to the Octagon with this Saturday night’s (April 23, 2016) UFC 197: “Jones vs. Saint Preux” pay-per-view (PPV) fight card, which takes place inside MGM Grand Garden Arena in Las Vegas, Nevada. Waiting for him will be light heavyweight replacement Ovince Saint Preux (19-7) – filling in for the injured Daniel Cormier — in the five-round headliner. The winner emerges as interim 205-pound titleholder and the next man to face “DC” to unify the straps later this year. In addition, longtime UFC flyweight champion Demetrious Johnson defends his 125-pound title against Olympic gold medalist Henry Cejudo in the UFC 197 co-main event. Based on the above EA Sports UFC simulation, “Mighty Mouse” retains by clear-cut decision. MMAmania.com will deliver LIVE round-by-round, blow-by-blow coverage of the entire UFC 197 fight card on fight night (click here), starting with the Fight Pass “Prelims” matches online, which are scheduled to begin at 6:30 p.m. ET, and then the remaining undercard balance on FOX Sports 1 at 8 p.m. ET, before the PPV main card start time at 10 p.m. ET. To see who else is competing on Saturday night’s UFC 197 fight card click here. LAS VEGAS — At UFC 197 media day, Ovince Saint Preux discusses whether he believes Jon Jones respects him as an opponent, if he feels less pressure with Conor McGregor stealing all the headlines and the hole in Jones’ game that he plans on exploiting. LAS VEGAS – At UFC 197 media day, former UFC light heavyweight champion Jon Jones and Ovince Saint Preux squared off Thursday at MGM Grand. Before Jon Jones and Ovince Saint Preux mix it up at next weekend’s (Sat., April 23, 2016) UFC 197 pay-per-view (PPV) event, the talented Light Heavyweight’s — who will be vying for the interim division strap — conducted a joint satellite interview during the UFC on FOX 19 telecast to preview their bout. The fight came to be after division kingpin Daniel Cormier was forced out with a knee injury. As a result, “OSP” stepped in on short notice to face the toughest challenge of his mixed martial arts (MMA) career. A move “Bones” says he’s grateful for. As is Saint Preux, as a win over the pound-for-pound great will do wonders for his career. The winner will get a chance to unify the title against “DC” later this year. And if all goes as planned for Jon, he may get the chance to reclaim the title in his home state of New York in November. That’s because Jon Jones refused to defend his Light Heavyweight title against Chael Sonnen at UFC 151 on less than 10 days notice after his original opponent, Dan Henderson, bowed out with an injury. What followed was an onslaught of criticism aimed at “Bones” and his team in Albuquerque, New Mexico. This time, though, Jones welcomed all comers as late replacements, as he recently revealed on The MMA Hour (via MMA Fighting) that he opted to break his protocol of accepting last-minute changes in foes as a way to make up for the whole UFC 151 debacle. He also reveals that Ovince Saint Preux wasn’t the first guy to accept the fight. Indeed, Jones has had his fans on edge over the last two years, with one legal hiccup after another, which includes a hit-and-run accident, a few stints in jail as well as a recent public relations dilemma after he was caught on tape engaging in a heated argument with a police officer. “Bones” and “OSP” will vie for the interim division title, with the winner earning a shot to unify the belts against Cormier later this year. To catch up on all things UFC 197 click here.